A healthy and simple recipe using only 9 ingredients! 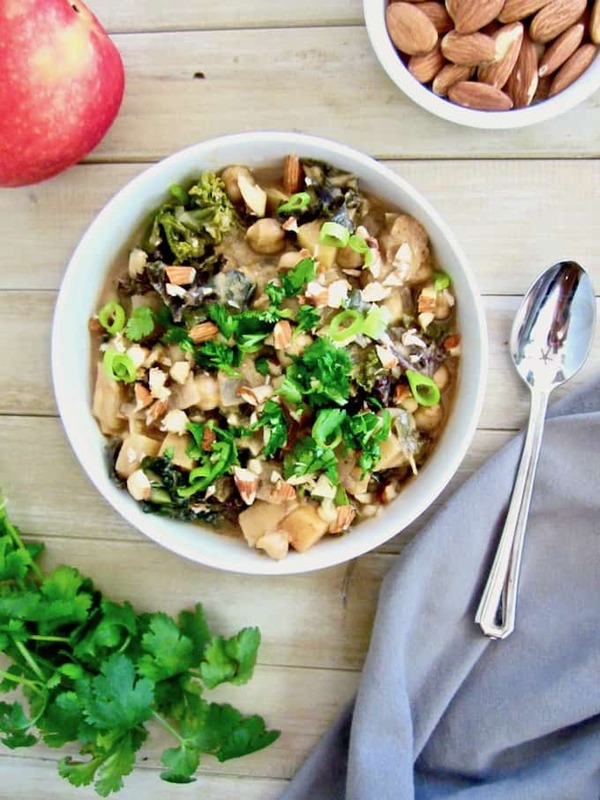 Savory and sweet with a bit of spice and protein makes this a perfectly balanced meal! Sugar free & oil free. Stew in May? Yea, I know. It kinda doesn’t make sense at first, but hear me out. A couple weeks ago it was a rainy, cold, spring day and all I wanted was something warm, comforting and nourishing. 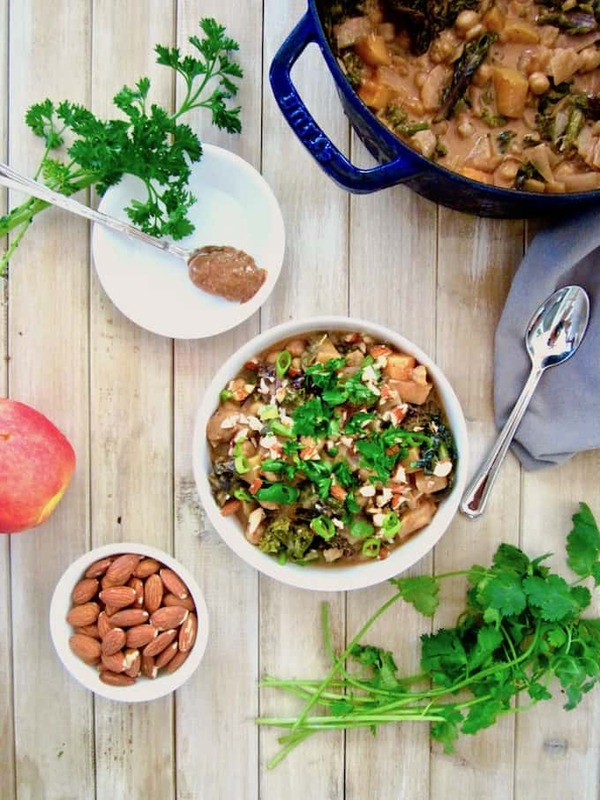 I remembered a peanut stew I made a few years ago with apples and kale, so made a spin off of that and really loved it, so didn’t want to wait until the fall to share it with you! Make sure you bookmark this for apple season in a few months. Although, there’s really no reason to wait – this can be enjoyed at any time of the year! I’ll share a post in the next couple weeks about my foodie experience, which has been off to an amazing start! For a sneak peek, here I am at A.N.D. Cafe – an all gluten free and almost all plant-based diner – in awe of my breakfast yesterday morning. I mean, I can’t tell you the last time I had a delicious waffle out at a restaurant, it’s been MANY years! I’ll tell you more about it in a future post. So for now, back to this stew. I love the simplicity of this recipe, using only 9 ingredients. The almond butter and apple combo adds natural sweetness. The hot sauce adds a little kick (or a lot of a kick, if that’s what you want!). The kale gives earthiness, boosts nutrition and just makes me happy. Kale rocks. Chickpeas, another favorite ingredient of mine (I mean, just read the name of this blog! ), give protein, savoriness and texture. Combine all that together = perfection! If you want it more soup-like (less chunky), just add more vegetable broth. Optionally top with more cilantro, parsley, green onion and crushed almonds. Looking for other stew or soup recipes? 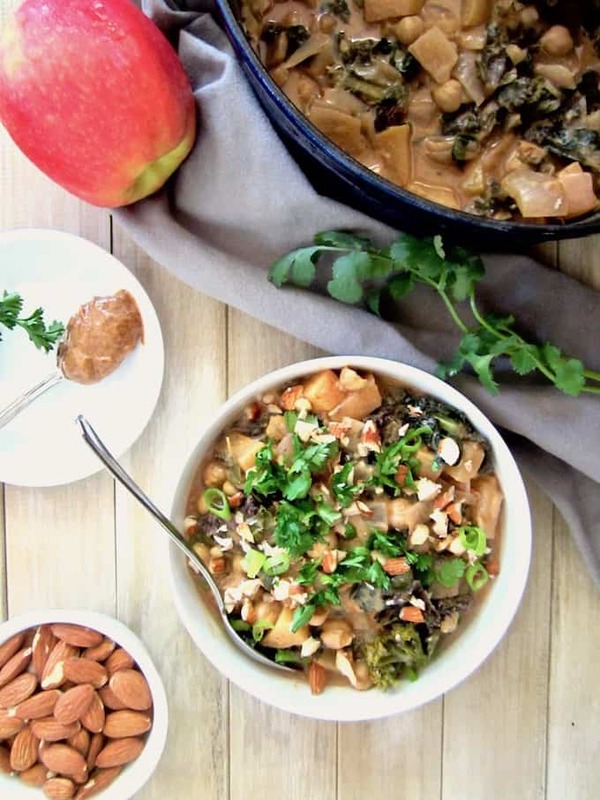 Try this Red Lentil Stew or Thai Red Curry Vegetable Soup! Happy Saturday and don’t miss next week’s post where I’ll be sharing a recipe for swoon-worthy Sunbutter Swirl Brownies! ? Heat 1/4 cup of the vegetable broth in a pot on med/high heat. Add the onion and garlic, cooking until softened, about 10 minutes. Add remaining 5 cups of vegetable broth and the chopped apple, bringing to a simmer. Simmer for about 5 minutes. Stir in the almond butter and hot sauce. Add chickpeas, salt and kale, cooking for a couple minutes for the kale to gently wilt. Stir in the cilantro. 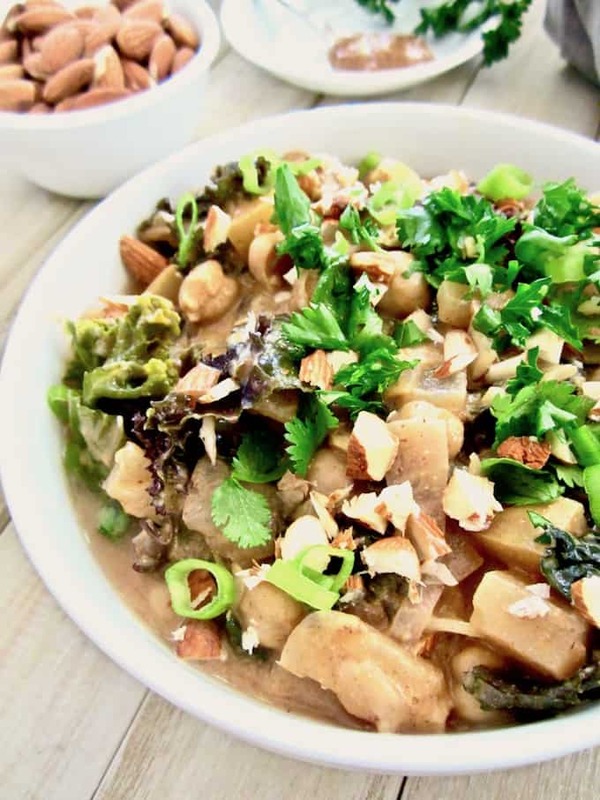 Serve and top with your choice of any of the following: more cilantro, parsley, green onions and crushed almonds. 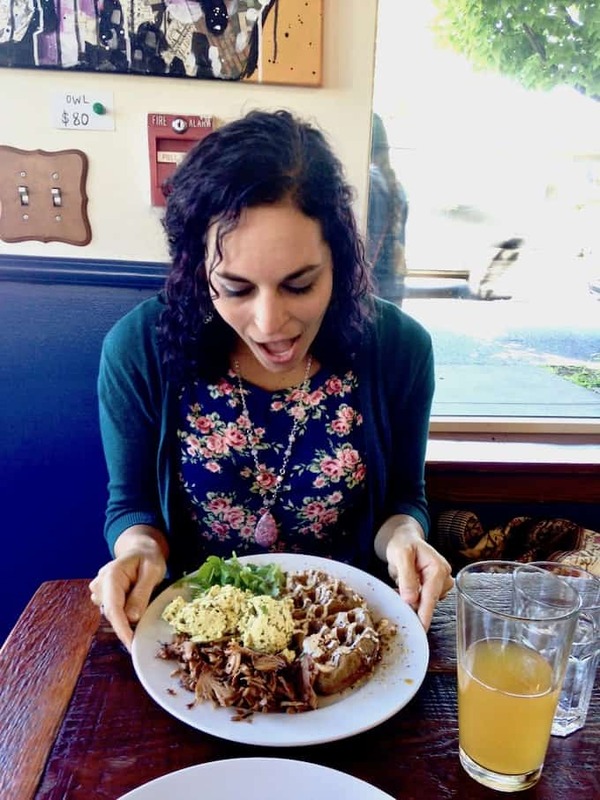 Glad you're loving PDX; it's a great town to be a vegan in. And A.N.D. Cafe is my FAVORITE breakfast spot. You chose well! This stew looks great, too! Why not stew in May? I'm visiting Portland for the first time in a few weeks! I can't wait! And your stew looks really delicious! OMG Amy you're gonna looooooove it here!!! Seriously, vegan (and gluten free!) food EVERYWHERE. Too many choices, too little time! ;) I really think it's the best place in the world to be vegan. Have an amazing trip! That sounds like just the coziest soup! I love the almond! I want to go back to Portland! I went a few years ago, and I didn't get see everything I wanted to see – or eat everything I wanted to eat! This stew looks great! I feel ya Dianne - I leave tomorrow and there is still so much food I wish I could eat! Portland rocks huh?! :-) Thanks for commenting! You had me at spicy! I love all those veggies and the touch of cilantro. Yum!